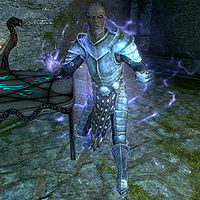 Haldyn is a Redguard elemental mage who can be found on the island of Japhet's Folly, far northeast of Winterhold. He is the leader of a group of pirates called the Blood Horkers, who have been harassing ships in the Sea of Ghosts. Haldyn is clad in a full set of leveled heavy armor. This includes the cuirass, a pair of boots, and a 50% chance of a pair of gauntlets. All his equipment can be up to steel plate quality or Nordic carved armor if Dragonborn is installed. Adelaisa Vendicci will instruct you to kill him in the quest Rise in the East in order to stop the pirates from plundering any more ships. Haldyn is skilled in Destruction magic and relies heavily on shock spells. This page was last modified on 7 August 2014, at 11:11.